Before my son even took a bite he exclaimed, “This is my new favorite breakfast!” Which is good because blueberries are brain food so it is a perfect start to the school day. In addition, blueberries have one of the highest ORAC values of any food in the world (ORAC is a rating system for antioxidant power). Preheat oven to 450 degrees. Combine lemon curd ingredients and cook over low heat whisking constantly until curd is thick enough that it sticks to a spoon (about 10-20 minutes). Combine dry popover ingredients (flour, sugar, and sea salt) in a bowl. Combine wet popover ingredients (zest, eggs, milk, and vanilla) in a separate bowl. Mix the wet ingredients with the dry ingredients. Place a skillet into the hot oven with the butter until it melts. 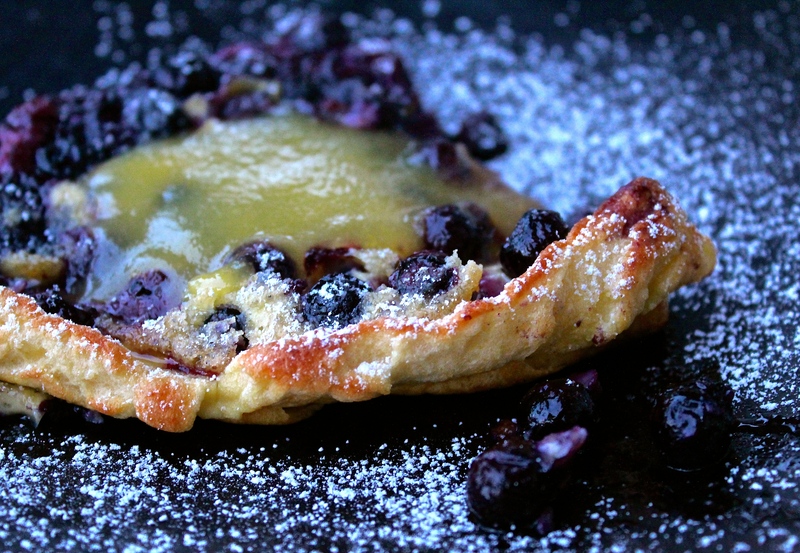 Carefully remove from oven, add the pancake batter, top with blueberries and return to oven. Bake for 15 minutes. Pancake will set in the center and puff around the edges of the pan, becoming golden. Serve hot with lemon curd and a sprinkle of powdered sugar. On day 37 of this 365 day project, I ate my daily five (including a couple of juicy, sweet clementines that infuse the air with the scent of orange blossoms when you peel them). Did you enjoy yours? this looks delicious! the popover reminds me a bit of a dutch baby, or is it more crisp than that? Thank you! I think they are the same…crisp on the edges, softer in the middle. My mother in law taught me to make popover pancakes years ago but maybe dutch baby is the formal name. They are so easy and so good!